out of the flaming fire, through our fear. the light, our safe harbor, shore. Write a poem of your own, based on Holly’s image or choose a line from Maureen’s poem as a starting place. 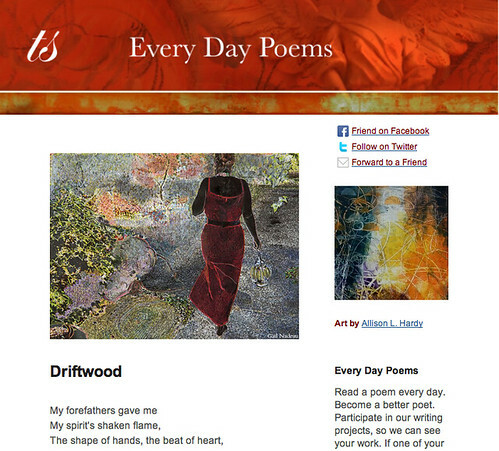 Post on your blog and link to us (we love that), or just drop your poems here in the comment box. Painting: “Warrior Canoe”, 30″ x 60″, by Holly Friesen. Used with permission. See more of Holly Friesen’s work in her online gallery. Poem by Maureen Doallas, author of Neruda’s Memoirs: Poems. Buy a year of Every Day Poems, just $5.99 — Read a poem a day, become a better poet. In March we’re exploring the theme The Pantoum. I was so pleased Holly allowed us to use the image of her gorgeous painting, which has been sold. From the time I saw images of it in progress, I knew I’d have to write about it. Maureen this is wonderful! I love it, and I wrote one too… I couldn’t get “Persephone Rising” out of my head…. I went to the web and refreshed my memory of her story. Rising Rising…. until the Fall. Thank you so much, Donna. I owe the inspiration to the painting. I hope everyone links over to read your poem. Lovely piece. Thank you for your kind words there. really nice article on building up new weblog.